Solid Liver Tumours with Cystic Appearance: Do They Have the Same Outcome? Objective: Paediatric undifferentiated embryonal sarcoma (UES) and mesenchymal hamartoma (MH) of liver have similar imaging cystic imaging characteristic but have totally different clinical behaviour. We reviewed ours experience and compared that with the literature. Methods: Our patients' database over the past 25 years and all articles available from PubMed up to December 2016 were searched. Case reports recorded with demographic data, clinical information and investigations were recruited. The diagnosis of all cases had to be confirmed by histopathology. The data was analysed by SPSS 11.0 software. Results: We identified 2 cases each of UES and MH in our centre, and from the literature, there were a total of 219 cases of UES and 138 cases of MH. The age at diagnosis for UES ranged from 1-83 years but 39.73% were between 6-10 years, whereas 65.22% of MH were found at <2 years (range, newborn-73 years). The chief complaint for UES was abdominal distension with or without abdominal pain and 50.81% of them had accompanied systemic symptoms. In contrary, only 9.57% of MH had systemic symptoms. Interestingly, both tumours were more commonly found in the right hepatic lobe. The prognosis of these two entities was quite different, 41/103 (39.81%) of UES died, whereas only 7/110 (6.36%) cases with MH died. UES required additional chemotherapy whereas MH did not. With the limited information, some authors suggested that the ultrasonography findings were better concordant with the histology than computed tomography or magnetic resonance imaging. 54.9% UES patients' tumour was solid and only 30.36% were cystic. For MH, there was no significant difference in the nature of tumour. Conclusion: Similar imaging appearance and possible pathological overlap between UES and MH makes the initial diagnosis difficult to be established. Surgical biopsy and excision remained mandatory to confirm the diagnosis and to guide the subsequent treatment option. Liver tumour only accounts for approximately 0.5-2% of all tumours found in paediatric age. Cystic-like hepatic tumours of children such as undifferentiated embryonal sarcoma (UES) and mesenchymal hamartoma (MH) are even rarer. Although UES and MH are both hepatic tumours of mesenchymal origin, UES is considered as a highly malignant liver tumour with a relatively poor prognosis but MH is a benign tumour. Due to the differences in prognosis and treatment approach of these two rare forms of tumour, it is essential to make timely and accurate diagnosis. However, their closely resembling cystic appearance by conventional imaging such as computed tomography (CT) scan or magnetic resonance imaging (MRI) makes the initial clinical diagnosis difficult to be established. Furthermore, the overlapping clinico-pathologic features of these two entities and the lack of information in the literature led to frequent confusion. So, in this article, we reported 4 of our cases (2 UES & 2 MH) in details and compared them with previously reported cases (219 UES & 138 MH) and we focused on their differences in terms of clinical presentation, imaging findings and outcome. A 13-year-old boy was incidentally detected to have a huge mass in the abdomen after a trivial abdominal trauma. Physical examination revealed non-tender hepatomegaly. His alpha fetal protein (AFP) and other tumour markers were normal. Ultrasonography (USG) examination showed a huge mass at right posterior hepatic lobe (14.7 x 12.3 x 12.3 cm) which contained a mixed cystic portion at upper and middle pole, with hyperechoic solid component at lower pole. The low echogenicity of the cystic area suggested either degraded blood product or semisolid contents. Feathery strands and septum were noted inside the cystic space. Low velocity arterial flow was identified at the solid area but the rest did not show hypervascularity. CT (Figure 1a) showed an 11 cm multiloculated lesion with both solid and cystic component, hypervascular and well encapsulated in the right lobe of liver. Abdominal MRI revealed that there was a well-defined 11cm diameter mass of heterogeneous signal in both T1-weighted images and T2-weighted images with evidence of fluid level inside. Eccentric areas of soft tissue component showing hypointense signal on T2-weighted images, and presence of gradual and abnormal enhancement after administration of intravenous gadolinium. In the early arterial phase, there was evidence of neovascularity seen especially over the lower part of the mass lesion. The patient underwent fine needle aspiration biopsy. Histological features were compatible with UES (Few strips of tumour containing spindled tumour cells in a loose tissue culture like stroma which included some endothelial lined vascular spaces. The tumour cells showed ovoid nuclei with considerable pleomorphism, vesicular chromatin and occasional multinucleated tumour giant cells. Mitotic figure was identified occasionally. Immunochemical study showed negative expression for cytokeratin, s-100, actin, desmin, HMB45 and CD31. MIB1 proliferation marker showed the tumour cells had a high proliferation index). Chemotherapy was started according to Intergroup Rhabdomyosarcoma Study-IV (IRS-IV) protocol. After 3 courses of VAC (vincristine, actinomycin, cyclophosphamide), follow-up CT showed the solid component was reduced in size, but there was only minimally interval change in the cystic part. Extended right hemihepatectomy was done and subsequently, he continued with the chemotherapy. At 6 months after completion of chemotherapy, CT found slightly heterogeneous parenchymal attenuation at segment IVb and repeated CT scan 3 months later revealed multiple hypo-enhancing liver lesions which were highly suggestive of metastasis. Tumour markers were normal at that time. USG-guarded biopsy was done and the features of the lesions, with presence of hepatocytes, bile ductules and some fibrous septae, were suggestive of focal nodular hyperplasia (FNH). The patient is currently well without evidence of local recurrence or metastatic disease at 12 years after chemotherapy. A 10-year-old girl presented with intermittent right abdominal pain and distension for few months and it was associated with malaise, anorexia and weight loss later. Her serum ALT and AST were both elevated but AFP was normal. CT scan (Figure 1b) showed enlarged right lobe of liver with a huge solitary mass measuring 15.1 x 11.9 x 15.9 cm and USG revealed a large mixed cystic and solid tumour over right lobe of liver with similar characteristics as case 1. Trisegmentectomy of liver was done due to rapidly mounting abdominal distension and pain. The tumour ruptured intraoperatively with peritoneal spillage. Histology was compatible with high grade poorly differentiated embryonal sarcoma. Tumour ruptured through the capsular surface with smooth circumscribed border and was composed of spindle to stellate cells lying in a markedly myxoid background. Tumour giant cells were hyperchromatic and contained markedly pleomorphic nuclei with frequent mitosis and sometimes multinucleation in scattered areas. Immunochemical study showed the expression of desmin, weak positivity for smooth muscle actin but negativity for AE1/3. She received IRS-IV protocol but it was cut short to 24 weeks due to severe veno-occlusive disease with subsequent portal hypertension and recurrent variceal bleeding. Fifteen months after chemotherapy, follow-up CT revealed a well-defined round lesion which enhanced at venous phase in seen at inferior tip of the liver. USG subsequently revealed that the liver parenchymal echogenicity was coarse, with cirrhotic change. There were several (at least 3) lesions in the lower parts of the liver with the largest one being 2.3 cm at the inferior tip. The largest lesion was slightly hyperechoic with hypoechoic centre. The other two were predominantly anechoic. USG-guided liver biopsy showed no evidence of malignancy and it was compatible with focal nodular hyperplasia. She remains to have portal hypertension with episodic variceal bleeding. At around 9 years post-treatment, she experienced abdominal distension again and imaging revealing multiple liver nodules and biopsy confirmed recurrence of UES. Her family declined further treatment and she passed away a few months later. 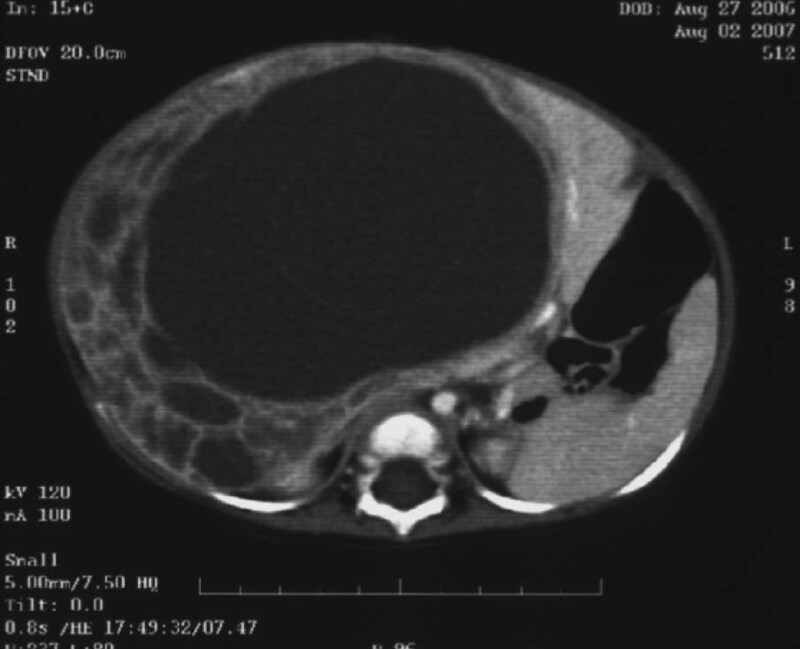 A 15-year-old girl presented with abdomen mass for 6 months and physical examination revealed non-tender gross hepatomegaly. CT scan revealed large cystic like tumour in the liver. Tumour markers and liver function tests were grossly normal except mildly elevated serum AST. USG-guided tumour biopsy was performed without any conclusion due to insufficient tissue. The patient then received liver wedge biopsy and the histology revealed tissue formed by hypocellular fibroblast-like stromal cells in a loose myxoid background compatible with MH. There was a markedly delicate chicken-wire configuration of vascular supply to the tumour. Only a very minimal bile duct element was noted in which abnormally dilated and curved bile ducts were seen mostly at the periphery of the tumour. No overt malignant cells were seen. Immunochemical study showed expression of actin, but negativity for cytokeratin markers of AE1/3.MIB1 (Ki-67) proliferation index was very low. The tumour was subsequently gross totally excised and she has been in remission for 10 years now. An 11-month-old girl presented with progressive abdominal distension for 14 days. Physical examination showed a large right upper quadrant mass. USG revealed multiple cystic mass (largest one 12 x 9.5 x 10.5 cm) with internal septations in the right lobe of the liver. CT showed multiple round hypodense lesions in the right lobe with well defined margin which was contrast non-enhancing. Laboratory tests showed normal liver function and AFP. Extended right hepatectomy was performed and the pathology confirmed MH. There was a loose myxoid stroma containing slender myofibroblast-like cells with elongated blood vessels and lymphatics. A few haphazardly arranged islands of normal looking hepatocytes were also present. Various sized and irregular branching bile ducts were scattered within the stroma resembling those seen in "ductal plate" malformation. The stromal cells were bland looking with no bizarre cells and mitotic figures were not seen. The clinical course of the patient remains uneventful and is now 9 years post-treatment. UES and MH are both rare hepatic tumour of mesenchymal origin. UES accounts for 9-13% and MH represents another 5-8% of primary liver tumours in children.1,2 However, their management and prognosis differ significantly. MH has good prognosis with surgical resection alone but UES requires combined surgery and intensive chemotherapy to achieve durable remission. However, it may be difficult to distinguish UES from the MH at diagnosis because of their similar cystic appearance in imaging with overlapping features in histopathology. We searched the English full-text literature on PubMed up to December 31, 2016. The diagnosis of all cases was confirmed by histopathology. Patients' demographic data, clinical information and investigations were reviewed. The findings of our cases were summarised in Table 1. The data analysis was by SPSS 11.0 computer software. There were a total of 219 cases of UES and 138 cases of MH, respectively (Table 2). Both MH and UES are predominantly paediatric tumours. Majority (65.22%) of reported MH occurred in children <2 years old (range: newborn-73 years, 79.72% <5 years, 82.62% <10 years) with a slight female predominance (F:M=1:0.68). Similarly, around 150 of the 219 (73.07%) cases of UES occurred in children <15 years of age (range:1-83 years, 11.42% <5 years, 51.15% <10 years) and there was no gender predilection (female to male ratio 1.06:1). Three of our patients were older than 10 yrs but it will be hard to draw any conclusion due to our small sample size. However, both MH and UES are not really that rare among adults in the literature (13.77% & 26.94% reported cases >16 years, respectively). MH classically presents with abdominal distension without associated systemic symptoms (52.13%) though respiratory distress or obstructive jaundice may be found in those with huge tumours.3-5 Abdominal pain occurred in 8.51% of MH cases and few of them might develop due to the torsion of pedunculated tumour.6 In contrary, the chief complaints of patients with UES often included abdominal distension and pain together with systemic symptoms such as nausea, anorexia and fever (50.81%). Interestingly, both MH and UES are more commonly found in the right lobe of the liver though some might occupy the whole liver.7-9 There was no characteristic abnormality found in the laboratory tests. The liver parenchymal and ductal enzymes can be normal and AFP is typically not elevated. However, elevation of AFP was occasionally reported in some cases9,10 In our patients, only one patient with MH had elevated liver parenchymal enzymes and AFP level. Interestingly, both of our UES patients were found to have multiple hypo-enhancing liver lesions, highly suggestive of metastasis in 6 to 12 months after completing chemotherapy. They were both confirmed to be focal nodular hyperplasia (FNH) by biopsy subsequently. To our knowledge, FNH is encountered in only 0.02% of children.14 In our review of the literature, we did not find any cases of UES subsequently developed into FNH during remission. The association between UES and FNH remained to be verified. For FNH, USG is often the initial investigation that identified a focal hepatic lesion with a central hypoechogenic stellate scar.15 FNH is usually homogeneous and iso-attenuating to the normal liver on CT scan. UES behaves in a highly malignant fashion and the prognosis is worse than MH. Forty-one out of 103 (39.81%) reported cases of UES died, whereas only 7 out of 110 (6.36%) cases with MH died. In 1970s, Stocker et al reported 80% of the 31 patients with UES died with a median survival time of less than one year.16 Leuschner et al reviewed cases from 1950-1988 and showed a better disease free survival of 37.5% in late 1980s.17 Italian and German reported that 17 children with UES treated with the protocol designed for childhood rhabdomyosarcoma could achieve 79% long-term survival with follow-up ranging from 2.4 to 20 years.18 With the development of multidisciplinary regimen including surgical resection, chemotherapy and liver transplantation, the prognosis of UES has improved over the past 20 years. Ten paediatric cases with UES achieved 90% overall survival rate after partial liver resection and adjuvant chemotherapy.19 100% event-free survival was reported in recent case series using upfront total resection and adjuvant chemotherapy.20 In our analysis of a total of 103 UES cases, pre-and post-operative chemotherapy combined with surgery achieved the best results (Table 3). Both of our UES patients had long survival (9 and 12 years) after the treatment but late relapse remains possible as in case 2. In the literature, several cases of UES in fact developed from MH or associated with MH.21-24 Some suggested it is a continuum between UES and MH in histopathology and cytogenetics.25 The evidence of a close relationship can be found in the cytogenetic findings in MH & UES and a common break point at 19q13.4 has been identified in MH & also UES arising from MH.26 Nowadays, in view of the risk of malignant transformation, early complete excision is still strongly recommended by most experts, although, some argued on its benign nature with the possibility of spontaneous regression. In conclusion, MH and UES are two closely resembling or even linked entities but with a diverse clinical behaviour and outcome. Timely and accurate diagnosis should be made so that appropriate treatment can be applied. Clinical features and imaging findings especially USG appearance are helpful to differentiate the two conditions. With combined surgical and chemotherapeutic approach, good long-term outcome can be achieved in UES patients nowadays. Whether focal nodular hyperplasia is commonly associated with UES after treatment remains to be verified in future study. 1. Yikilmaz A, George M, Lee EY. Pediatric hepatobiliary neoplasms: An overview and update. Radiol Clin North Am 2017;55:741-66. 2. Raffensperger JG, Gonzalez-Crussi F, Skeehan T. Mesenchymal hamartoma of the liver. J Pediatr Surg 1983;18:585-7. 3. Lennington WJ, Gray GF Jr, Page DL. Mesenchymal hamartoma of liver: a regional ischemic lesion of a sequestered lobe. Am J Dis Child 1993;147:193-6. 4. Kitano Y, Ruchelli E, Weiner S, Adzick NS. Hepatic mesenchymal hamartoma associated with mesenchymal stem villous hyperplasia of the placenta. Fetal Diagn Ther 2000;15:134-8. 5. Karpelowsky JS, Pansini A, Lazarus C, Rode H, Millar AJ. Difficulties in the management of mesenchymal hamartomas. Pediatr Surg Int 2008;24:1171-5. 6. Bašković M, Dinkić M, Župančić B, Stepan J, Cizmić L. Torsion of a mesenchymal hamartoma of the liver in a 1-year-old boy. Acta Chir Belg 2017;117:128-30. 7. Alwaidh MH, Woodhall CR, Carty HT. 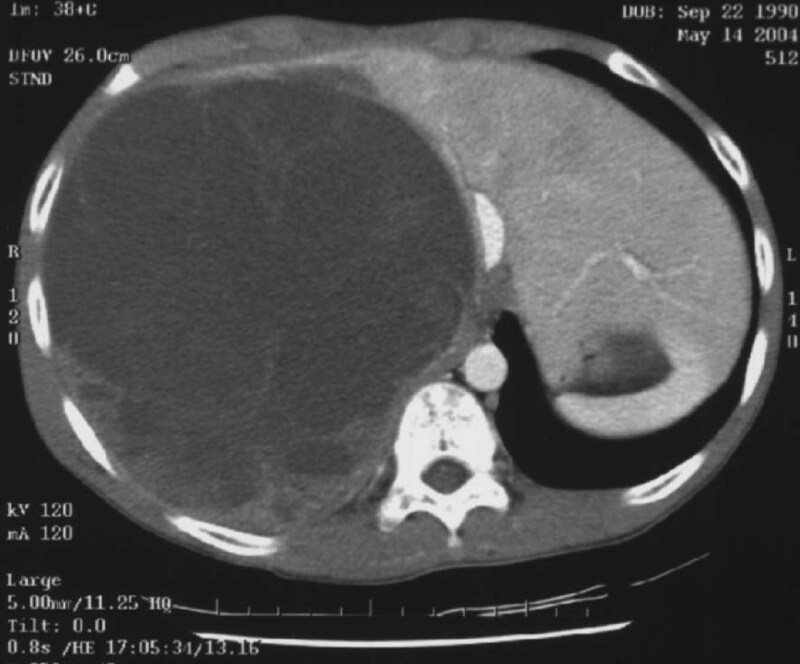 Mesenchymal hamartoma of the liver: a case report. Pediatr Radiol 1997;27:247-9. 8. Baron PW, Majlessipour F, Bedros AA, et al. Baron Undifferentiated Embryonal Sarcoma of the Liver Successfully treated with chemotherapy and liver resection. J Gastrointest Surg 2007;11:73-5. 9. Gunes D, Uysal KM, Cecen E, et al. Stromal-predominant mesenchymal hamartoma of the liver with elevated serum alpha-fetoprotein level. Pediatr Hematol Oncol 2008;25:685-92. 10. Fretzayas A, Moustaki M, Kitsiou S, Nychtari G, Alexopoulou E. Long-term follow-up of a multifocal hepatic mesenchymal hamartoma producing a-fetoprotein. Pediatr Surg Int 2009;25:381-4. 11. Chang HJ, Jin SY, Park C, et al. Mesenchymal hamartomas of the liver: comparison of clinicopathologic features between cystic and solid forms. J Korean Med Sci 2006:21:63-8. 12. Buetow PC, Buck JL, Pantongrag-Brown L, et al. Undifferentiated (embryonal) sarcoma of the liver: pathologic basis of imaging findings in 28 cases. Radiology 1997;203:779-83. 13. Wildhaber BE, Montarull E, Guerin F, Branchereau S, Martelli H, Gauthier F. Mesenchmal hamartoma or embryonal sarcoma of the liver in childhood: a difficult diagnosis before complete surgical excision. J Pediatr Surg 2014;49:1372-7. 14. Ma IT, Rojas Y, Masand PM, et al. Focal nodular hyperplasia in children: an institutional review of the literature. J Pediatr Surg 2015;50:382-7. 15. Bartolotta TV, Taibbi A, Midiri M, Lagalla R. Focal liver lesions: contrast-enhanced ultrasound. Abodm Imaging 2009;34:193-209. 16. Stocker JT, Ishak KG. Undifferentiated (embryonal) sarcoma of the liver: report of 31 cases. Cancer 1978;42:336-48. 17. Leuschner I, Schmidt D, Harms D. Undifferentiated sarcoma of the liver in childhood: morphology, flow cytometry, and literature review. Hum Pathol 1990;21:68-76. 18. Bisogno G, Pilz T, Perilongo G, et al. Undifferentiated sarcoma of the liver in childhood. Cancer 2002;94:252-7. 19. Ismail H, Dembowska-Bagińska B, Broniszczak D, et al. Treatment of undifferentiated embryonal sarcoma of the liver in children--single center experience. J Pediatr Surg 2013;48:2202-6. 20. Mathias MD, Ambati SR, Chou AJ, et al. A single-center experience with undifferentiated embryonal sarcoma of the liver. Pediatr Blood Cancer 2016;63:2246-48. 21. Ramanujam TM, Ramesh JC, Goh DW, et al. Malignant transformation of mesenchymal hamartoma of the liver: case report and review of the literature. J Pediatr Surg 1999;34:1684-6. 22. Lauwers GY, Grant LD, Donnelly WH, et al. Hepatic undifferentiated (embryonal) sarcoma arising in a mesenchymal hamartoma. Am J Surg Pathol 1997;21:1248-54. 23. Bove KE, Blough RI, Soukup S. Third report of t(19q)(13.4) in mesenchymal hamartoma of the liver with comments on link to embryonal sarcoma. Pediatr Dev Pathol 1998;1:438-42. 24. Mascarello JT, Krous HF. Second report of a translocation involving 19q13.4 in a mesenchymal hamartoma of the liver. Cancer Genet Cytogenet 1992;58:141-2. 25. Murthi GVS, Paterson L, Azmy A. Chromosomal translocation in mesenchymal hamartoma of liver: what is its significance? J Pediatr Surg 2003;38:1543-5. 26. Tucker SM, Cooper K, Brownschidle S, Wilcox R. Embryonal (undifferentiated) sarcoma of the liver with peripheral angiosarcoma differentiation arising in a mesenchymal hamartoma in an adult patient. Int J Surg Pathol 2012:20:297-300.